Austin’s music roots run as long and deep as the history of Texas itself. Classic country music is revered here in the honky-tonks and dance halls (Willie Nelson owns an area ranch and holds a much-loved annual July 4th country concert). But emerging artists representing a variety of musical styles, from electronic to rock and blues, are just as welcome. And besides playing in Austin’s many nightspots, you’ll hear them everywhere from the airport to alfresco coffeehouses to grocery stores. Austin isn’t kidding when it calls itself the Live Music Capital of the World®. 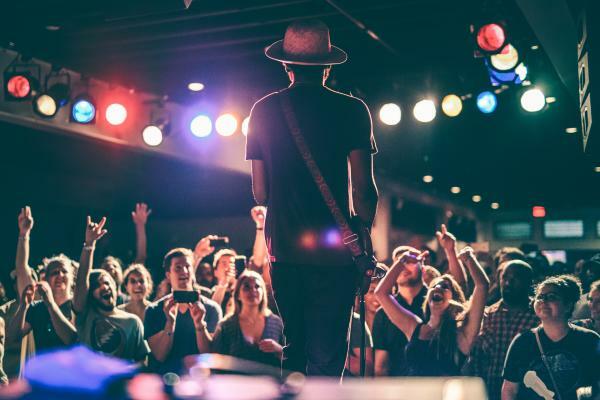 Read on for the scoop on some great spots the locals like to go to hear musicians all around the city. ACL Live at the Moody Theater. Credit Scott Newton Photography. 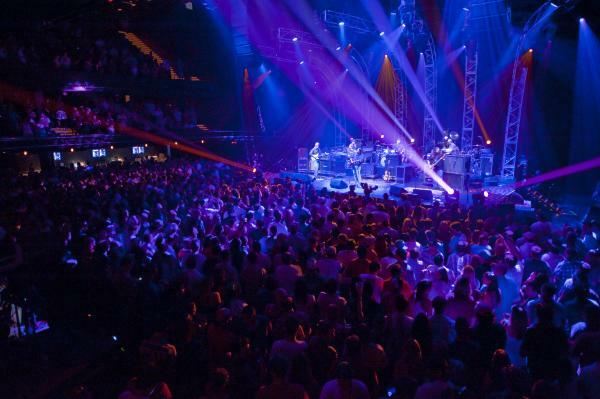 For the ultimate Austin music tour, visit Austin City Limits (ACL) Live and get a behind-the-scenes look at the Moody Theater, where the famed Austin City Limits television show is taped (it’s the longest-running music series in American television history, by the way). See photographs of past ACL performers by noted music photographers Jim Marshall and Scott Newton, and check out the statue of Willie Nelson on the aptly named Willie Nelson Boulevard out front. ACL Live hosts some 100 concerts a year. 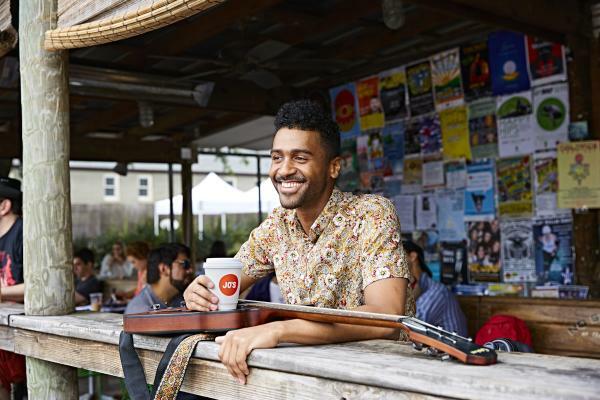 Join in the Austin Live Music Crawl with Austin Detours, led by a local musician who will take you off the beaten tourist path. Discover hidden gem music venues tucked into neighborhoods and see 2-3 shows in a three-hour tour span. Get some exercise and catch live music performances at the same time with an electric bike rental from Rocket Electrics. Join the guided four-hour Foodie Tour and you’ll visit hip gastro-pubs and food trailers where musicians regularly play. The mission of the Texas Music Museum is to collect and preserve artifacts that document the diverse traditions of Texas music. But beyond exhibits that focus on topics such as Tejano music or the contributions of East Austin’s African-American musicians, the museum also hosts regular live performances, along with the annual International Music Festival in September. Vic Mathias Shores (formerly Auditorium Shores) is a popular park-like location for outdoor concerts and festivals. Before or after a show, visit the Stevie Ray Vaughan memorial statue, located along the south bank of Lady Bird Lake on the Ann and Roy Butler Hike-and-Bike Trail. The statue pays tribute to the influential blues guitarist who played many shows in Austin and was a native Texan. Musician Tje Austin at Jo&apos;s. Credit Annie Ray. Güero’s Taco Bar is known for its icy cold margaritas, fresh Mexican dishes (including handmade corn tortillas and mole) and the live music performed in its next-door Oak Garden. Kick back and enjoy the music performances held Wednesday through Sunday. Stubb’s Bar-B-Q was founded in Lubbock in 1968, but its legacy continues in Austin, where Stubb’s is a music institution that serves up lip-smacking barbecue along with some of the best live bands around. Sit down for the Sunday Gospel Brunch and enjoy live music with your Southern comfort food. Meet the locals at Banger’s Sausage House & Beer Garden, where the tables are communal, 100+ craft beers are served and the menu consists of sausages (ranging from wild game to veggie) cooked on a sizzling grill. Come on Sundays for the Big Band Brunch, with live music from noon-3 p.m.
Keep caffeinated with an iced Turbo from the see-and-be-seen Jo&apos;s Coffee and snap a souvenir selfie with the “I love you so much” mural painted on the coffee bar’s wall. Jo’s House Band performs with special guests during the Sunday afternoon alfresco Sinner’s Brunch. You can catch six acts in a single night at The Saxon Pub, a haven for singer-songwriters since 1990. See a free weekday happy hour show, a weekend matinee or a late-night performance. Some of the biggest names in music have played the small Saxon, including Kris Kristofferson, who likened the experience to playing in his own living room. The Little Longhorn Saloon has served as the center of Austin’s honky-tonk country music scene for more than four decades. At least 10 bands perform each week and there’s never a cover charge. Little Longhorn is also known for its six-days-a-week happy hour (with $1 Lone Star beers) and its popular Sunday Chicken S**t Bingo. Located across the street from the University of Texas since 1974, the storefront Hole in the Wall stage has hosted everyone from newer bands like Spoon (who shot the video for their song "Jealousy" in the men’s room) to Don Henley of the Eagles, who dropped in to sing background vocals for Mojo Nixon’s MTV-era hit "Don Henley Must Die." Stop in on Monday nights for Unplug This, featuring local songwriters. Plan a private party at the Gibson Entertainment Relations Showroom, where you can have a live band on stage surrounded by awesome displays of Gibson guitars and photos of music legends such as Emmylou Harris and Les Paul. The 4,600-sq.-ft. showroom can hold up to 250 partiers. Gary Clark Jr. at Antone&apos;s. Credit Roger Ho. Search for hard-to-find vinyl and see an in-store music performance at Waterloo Records, a local music icon that showcases all musical styles, with a soft spot for Texas musicians. Open since 1982, Waterloo has seen a lot of changes in Austin’s music scene, supporting all of the artists along the way and helping music lovers discover them. Staffed by musicians, South Austin Music is the place in town to buy new and vintage instruments, as well as accessories. You can also pick up fun gear like colorful hats, sunglasses and t-shirts. South Austin Music has been a local staple for more than 25 years. Antone’s Record Shop was founded by the owner of the legendary Antone’s Nightclub, Austin’s home of the blues. Just north of the University of Texas campus, Antone’s Record Shop specializes in blues and Texas artists, with a huge selection of used vinyl that includes many out-of-print recordings. Wild About Music is an art and gift gallery dedicated entirely to music. The shop represents more than 100 international artists and carries thousands of music-themed items, from guitars to holiday ornaments. Musicians play live in the gallery. Visit its sister store, Austin Rocks, for souvenir t-shirts from Austin City Limits and edgy rock-inspired apparel. The Gift Shop at the Austin Visitor Center offers unique items crafted by Texas artists, along with official Live Music Capital of the World® merchandise. Pick up the 19-song CD compiled by ALL ATX and the Visit Austin Music Office, “Back to The Armadillo,” a collection of tracks by some of Austin’s most beloved musicians. The Austin Visitor Center is also the site of the Daybird live music series in the summer.